On March 23, 2017, we invite you to join our Pedro Sousa on the #3rd meetup about DevOps that, this time, will also be held at DevScope. DevOps Porto is a community for everyone interested in reducing the pain of software delivery and in building “bridges” between development and operations, where you can discuss all DevOps related topics from the cultural perspective, such as communication and collaboration, and from the technical perspective, such as source control, continuous integration and continuous delivery. On this the #3rd meetup about DevOps, Pedro Sousa will share a talk on “Azure Container Services”. He will do a brief overview of Azure’s current offerings for Container deployment and orchestration but also where and how you can start to explore the environments and build a simple DevTest Lab. 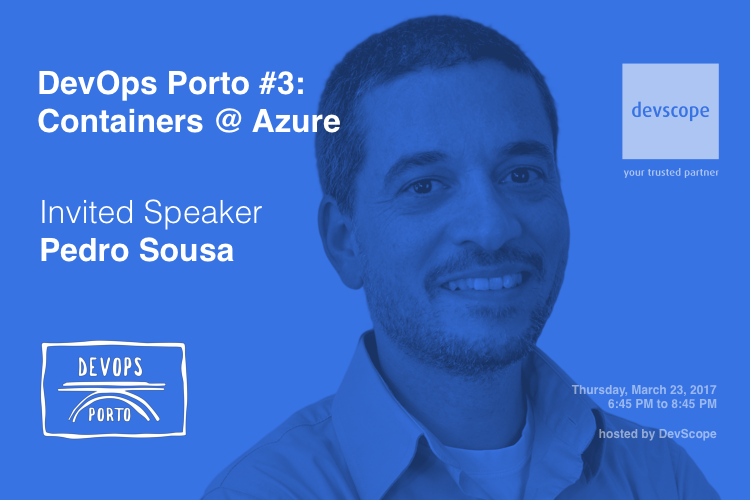 To register for the meetup and more information about the schedule, go to DevOps Porto #3: Containers @ Azure. See you on Thursday, March 23, 2017.